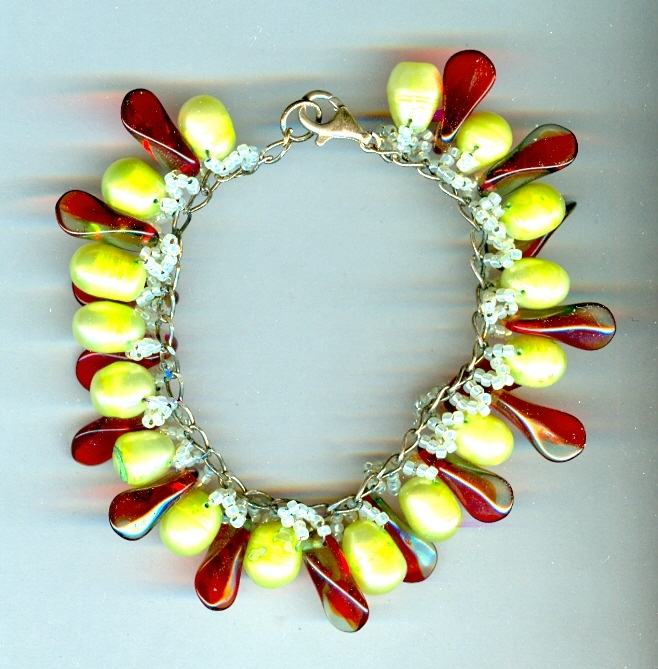 Bright -- nearly neon -- green freshwater pearls join interesting red glass drops in this hand beaded charm bracelet. The drops are paddle-shaped and have a hint of olive green swirling through them. Together with the pearls and the glowing pale seed beads, it puts the viewer in mind of exotic South Seas blossoms. 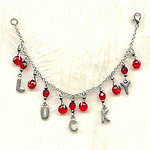 The pearls and drops are securely beaded to sterling silver curb chain. The (approximately) 7-1/2" bracelet closes with a sterling silver lobster claw clasp. Lovely and truly one-of-a-kind, it's the perfect gift for your Polynesian princess. With gifts fit for royalty, but with prices fit for commoners, we remain, SPARKLE PLENTY.